The double Birthday Party! After realizing my children would have birthdays only days apart I started to dream about all the different birthday themes we could use that were boy/girl friendly. 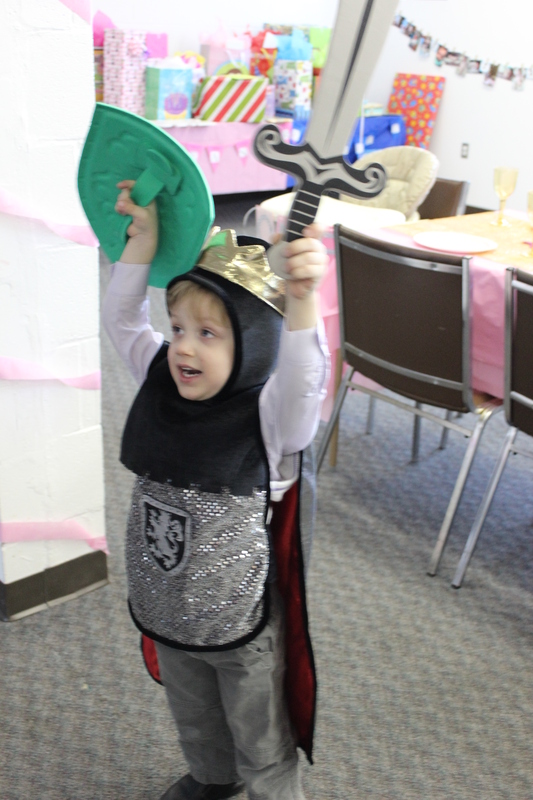 I had a very long list but ended up deciding on Knights and Princesses since castles, knights and dragons were a big deal to Everett after visiting Casa Loma in Toronto his imagination had gone wild. So here it is in pictures! The Cake table! 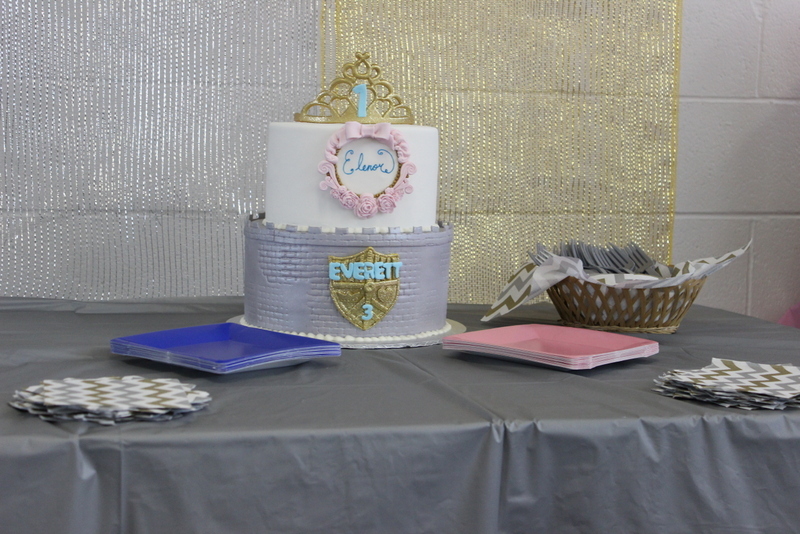 The two tiered cake was made by Above and Beyond Cupcakes in Welland, Ontario. This was the mega splurge for the party and was a gift from the kid’s auntie. 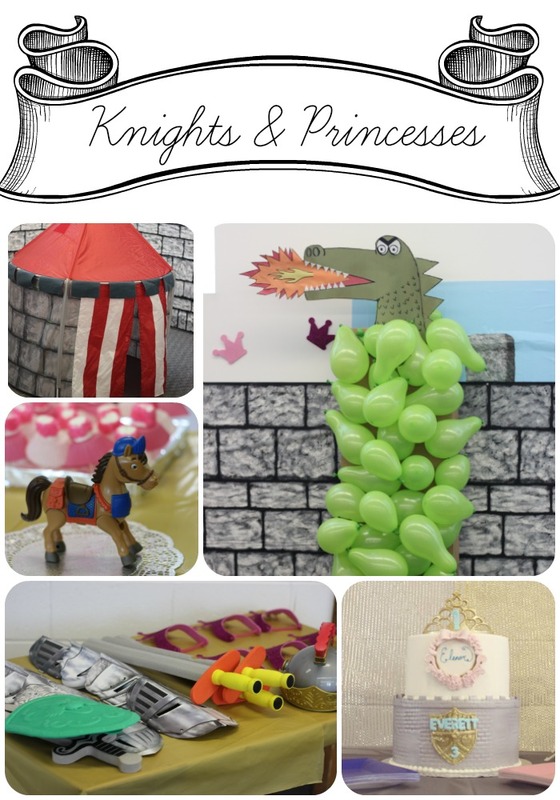 We were so pleased with how it fit the theme and incorporated both kiddos names and ages. 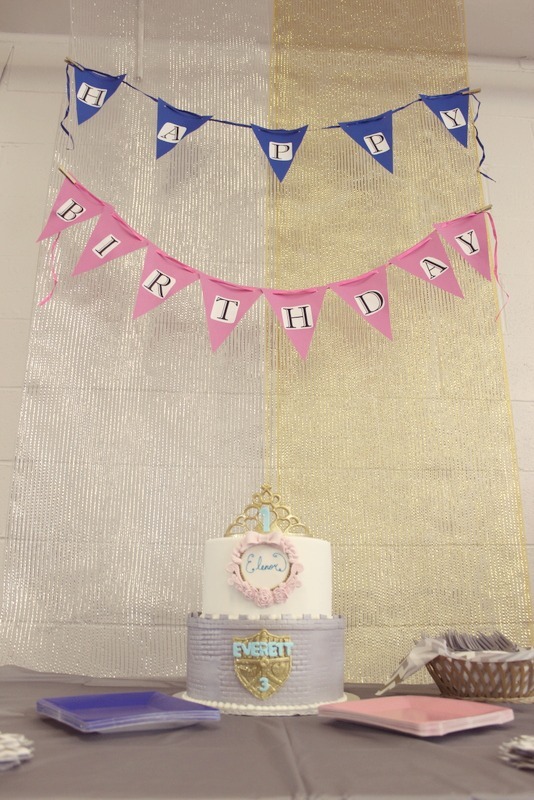 Banner was made using bunting purchased at Michaels and letters were printed off the computer and pasted on. Back drop is mesh also purchased at Michaels which was much cheaper than buying tulle or something similar. 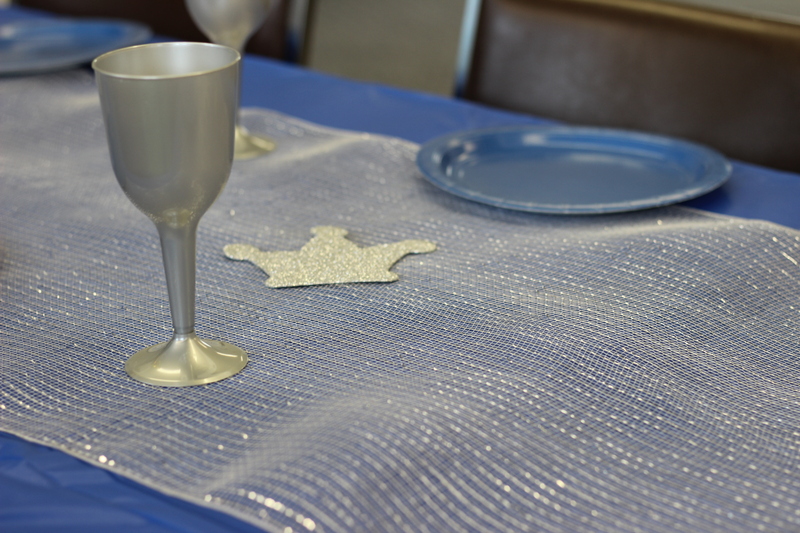 This was also used along the center of the table and kept very well, it will be used again! The Birthday Boy – 3! 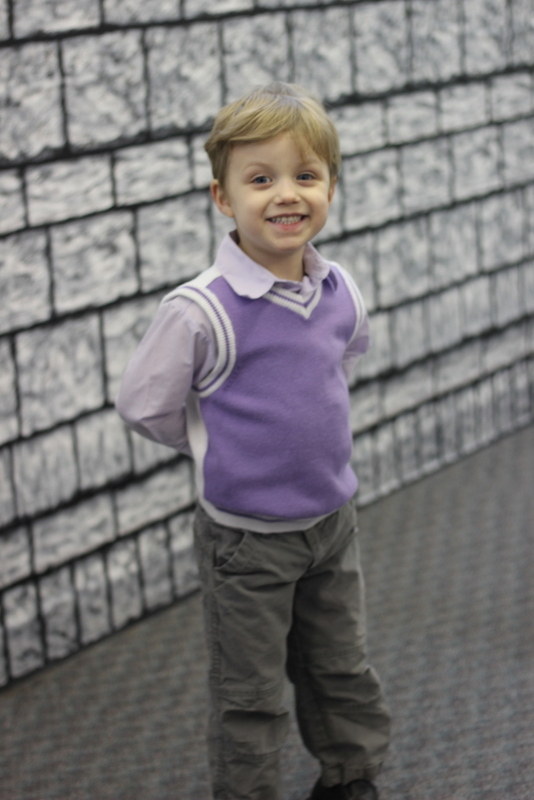 The castle wall back drop behind him was a steal for only $20 at the local party store, it stretched 30 feet around the room! 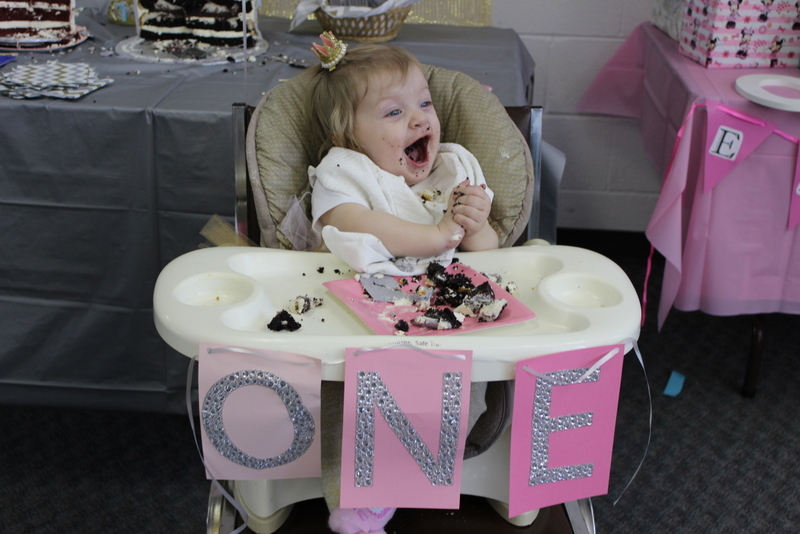 What would a first birthday be without a cake smash! 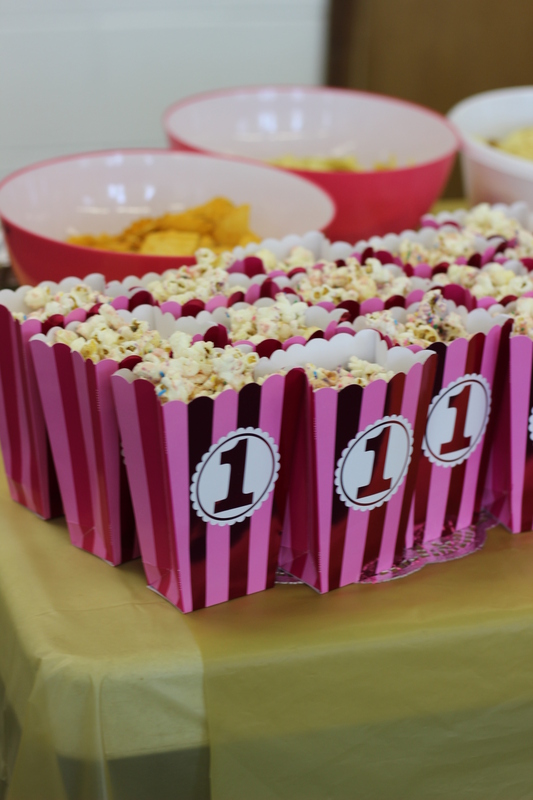 Delicious princess popcorn using pink candy melts and sprinkles! 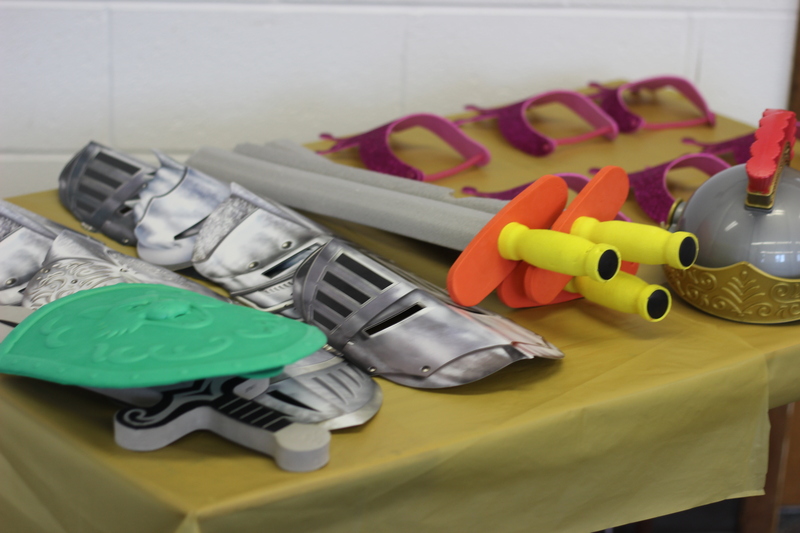 “Invitation to play” – Foam swords, masks and tiaras all found at the dollar store or Michaels. 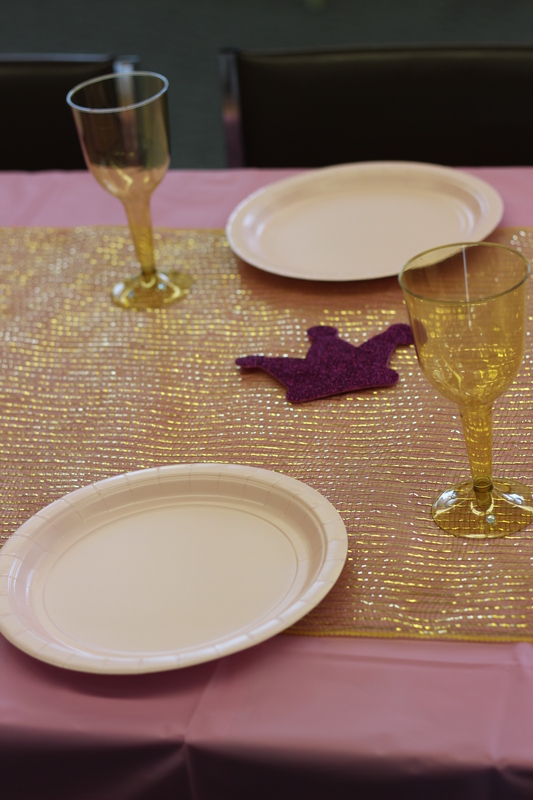 The “grand table” was set half royal blue/silver for the knights and half pink/gold for the princesses. 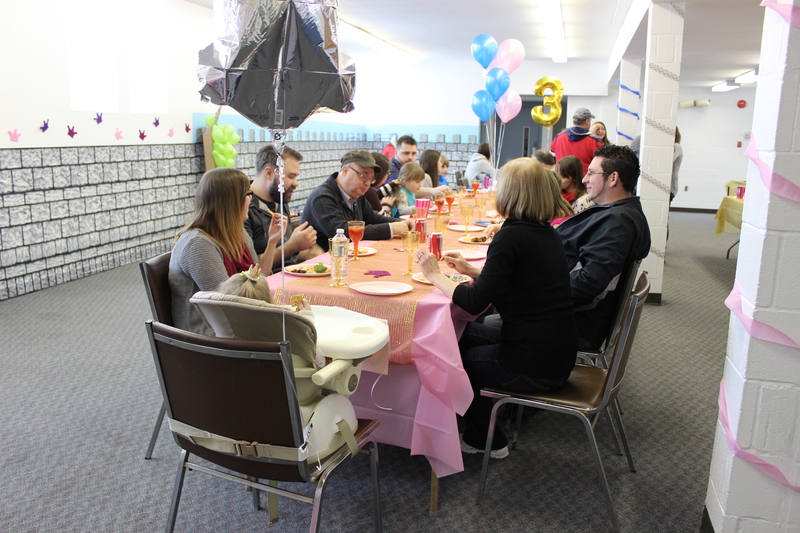 Separated in the middle with a bunch of balloons set on the table with weights. A birthday child at each end of the table as the heads! “Slay the dragon” activity! My sweet husband blew up the green balloons and painted the face of the dragon using cardboard and spray paint then construction paper for the fire. SO thankful for a creative husband! 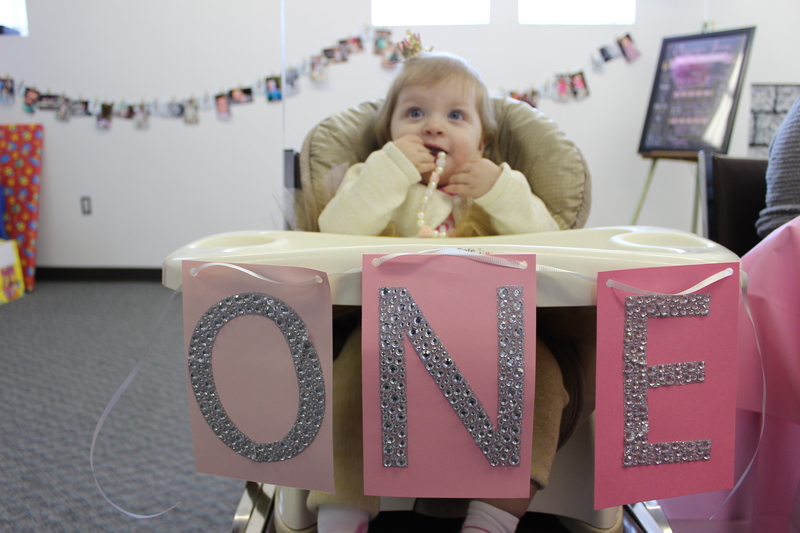 Eleanor’s first year birthday timeline. I re-used the numbers I had made from Everett’s first birthday two years before. 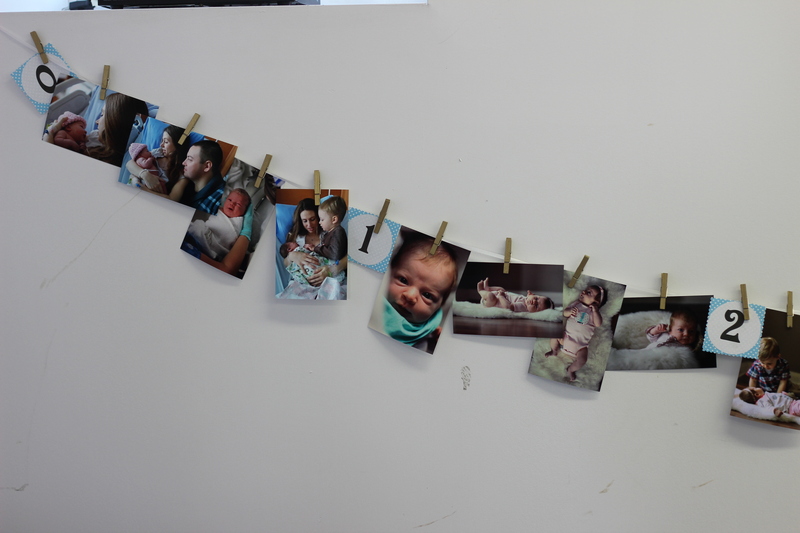 This only cost what it took to print the pictures which were good to have printed anyways! 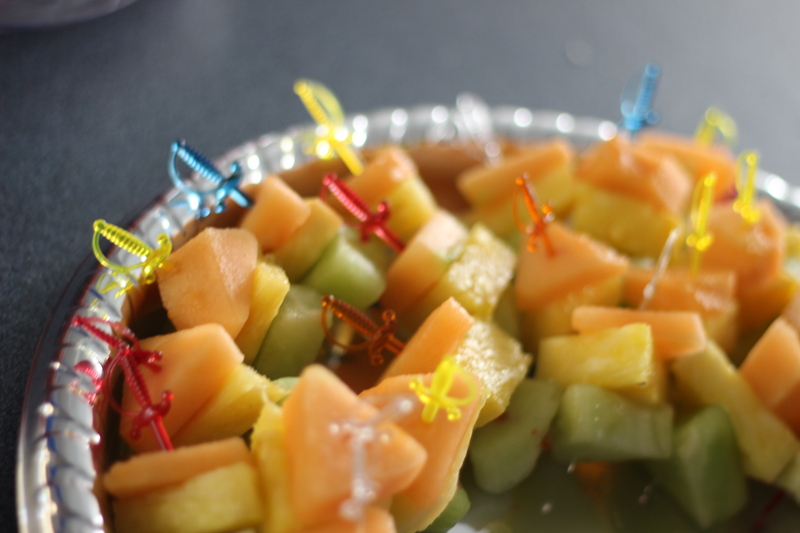 “Princess wands” – made with skewers and fruits pictures. I used a Pampered Chef fruit and cheese shape cutter to make the hearts out of the watermelon. These were much faster and easier to assemble than I expected. 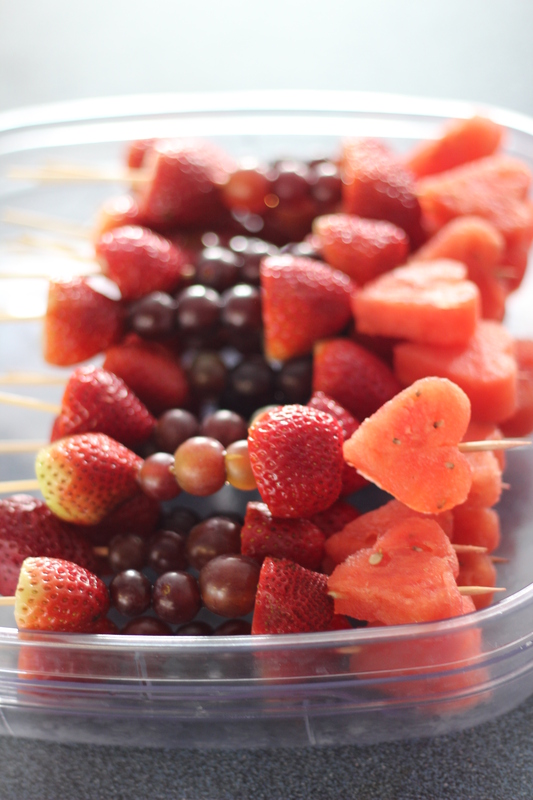 “Knight’s Swords” more fruit skewers! Went cheap with the highchair decoration! Card stock with sticky sparkly letters that were a dollar each at Michaels. Just punched some holes and added ribbon. Easy-peasy! A shot down the length of the room. About 35 people attended. 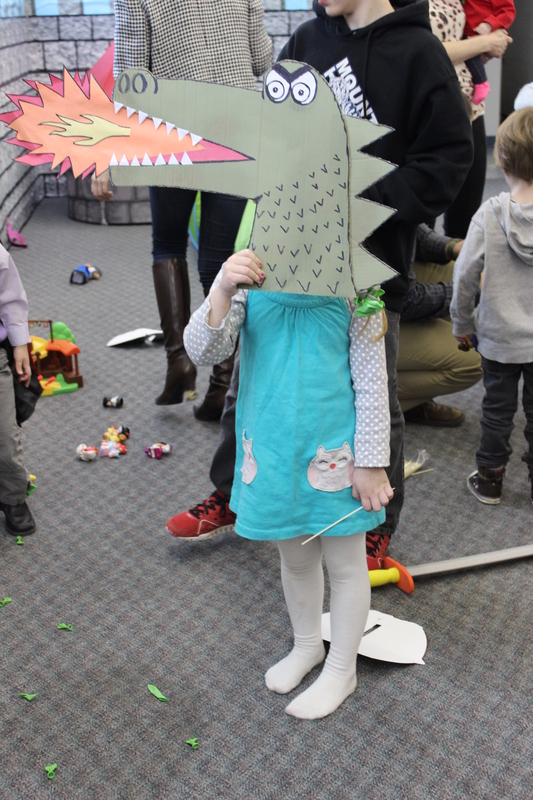 The dragon was slain fairly quickly – still a worthwhile activity though! We then headed home and completed a more controlled first birthday cake smash session at home! Hi I love the game slay the dragon but you never said how you played it though? Dumb question — but what did the kids use to pop the balloons in the dragon-slaying game? 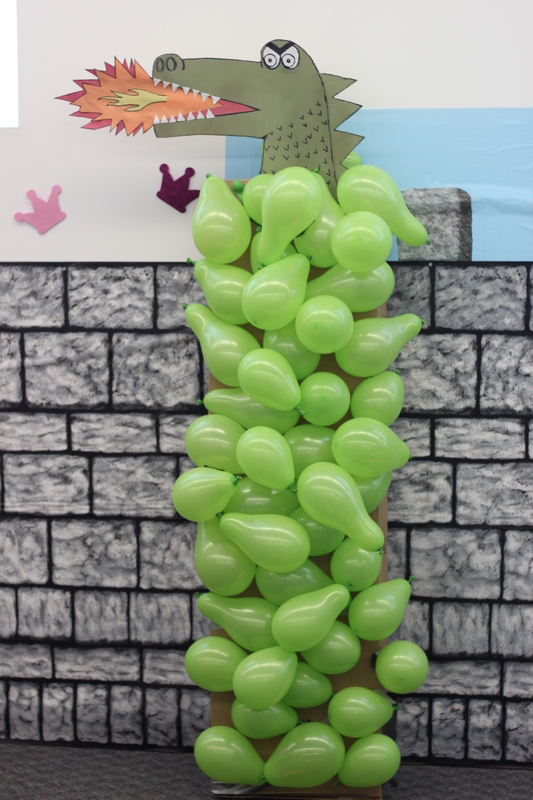 Hi— super dumb question, but on the dragon slaying game, what did the kids use to pop the balloons? Did they take turns or was it a free-for-all? Thanks! Hey! It was a bit of a free for all since the kids were all 3 and under! My husband monitored and they used a wooden skewer (so dangerous I know!) If the kids were older taking turns would have been a good idea!